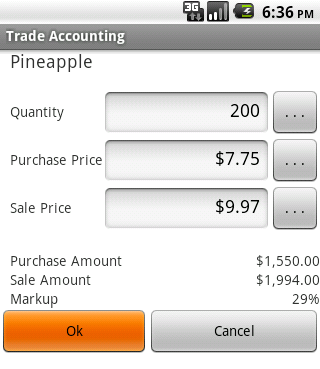 ANDRIY.CO - Trade Accounting. How to take goods to the warehouse and pay for it. 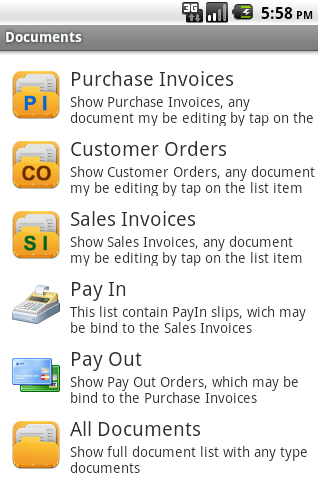 and the menu, select "Purchase Invoices". On your phone, press "Menu" button. Click "New Document". This opens a new Purchase Invoice. 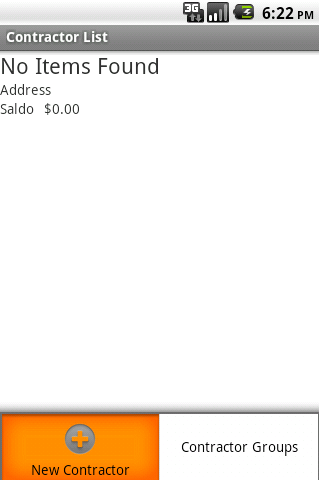 The document number is inserted automatically. If necessary, change it. If you want to change the date of the document, click on a date. Now we choose a contractor. 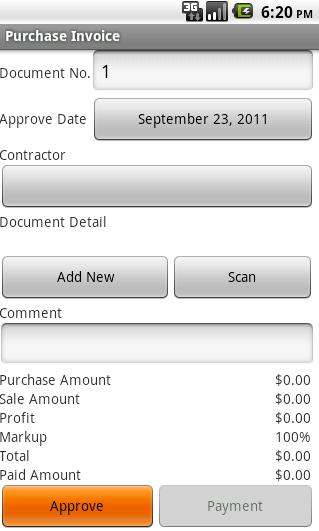 Click on the button under the "Contractor." Initially, contractors directory is empty. Add a new one. Fill in all required fields. 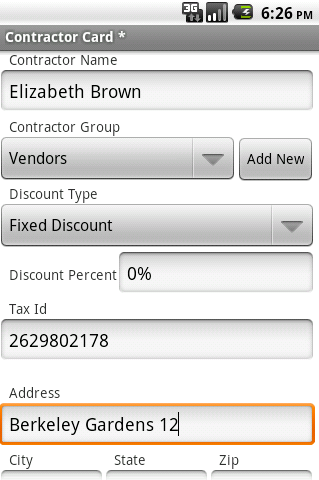 If the current Contractor Group is missing, add it by clicking the "Add New" button. And press the "Back" button on our phone. Now a very important thing. We as developers do not want to clutter up the screen with unnecessary buttons. We wanted to implement an interface entirely in the android-ideology. Android-standard interface provided to automatically save data when you press the "Back" button. But for the database application is not always acceptable. If data has been changed by the user will see a message about saving data. Click "Yes" and exit the form. When this data is stored. Click "No" and exit. The data are not stored. I click "Back" and remain in this form for further editing. 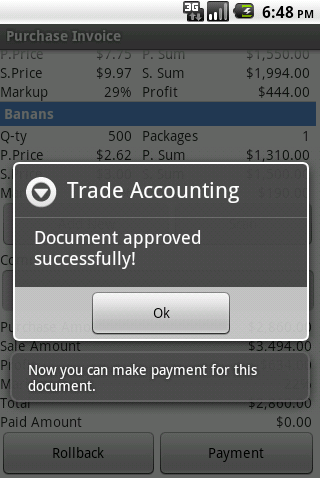 This behavior is used in any editor Trade Accounting - the editor of goods, invoices, purchase orders, payments, etc. Click "Yes" and save the data. As we see in our list has its first contractor. We mention it in the bill, a simple click. Now we need to add goods to our purchase invoice. We do this by clicking on the "Add New" button. 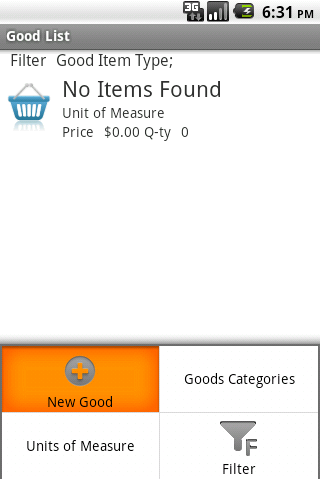 List of goods is also empty. Add a new product. 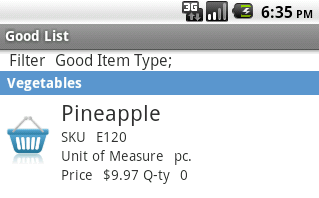 Enter the name and part number (if used), add a group of products and a unit of measurement ("Add New" button). Specify the number of packaging and the default quantity. This is optional, just with these amounts of useful work in the future. As a "default quantity" indicates the amount that you normally sell at a time, since the sale documents are usually much more purchase documents. 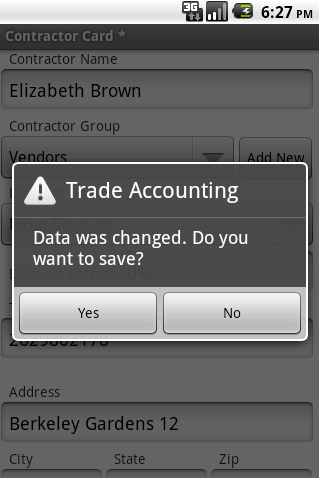 As is the case with a card listing, click "Back" button and confirm the saving data. Our list has a hot product, which is chosen by a simple push. We switched to editing the procurement of the party. Shopping Party - a record for a particular product in a credit note. Here we introduce prihoduemoe number, the purchase price. It also is convenient to set the retail price. 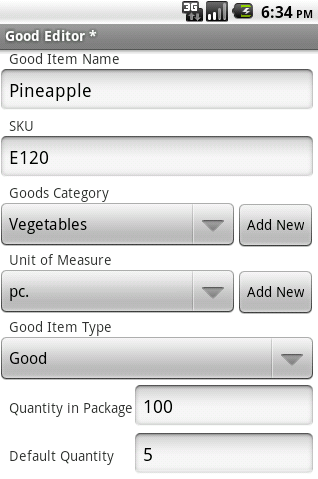 Later, in the process of posting paper retail price of the consignment will be stored in the "Tsena1" in the item card. Also given different information calculated: the amount of purchase and retail prices, as well as the percentage mark-up. This image we see an invoice with the final line. At the bottom you can write something. 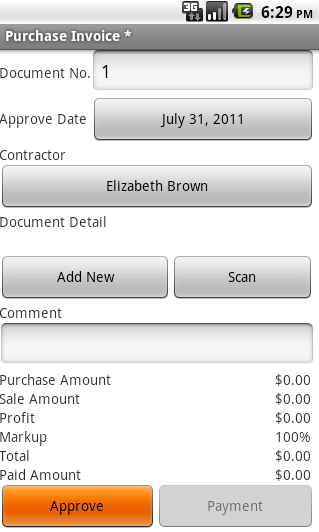 Now you can get out of the invoice by clicking "back" and save it. You can return to editing it later. But the goods at the warehouse still will not get. The consignment note is in "pending" status. That the goods were in stock, and turned into a bill approved by the paper, it should hold. What happens in the process of posting? Program "reads" the invoice and increase the quantity of goods in trade balances (in reference goods). Retail prices listed in a credit note, written in the handbook of goods in the "Price of 1". 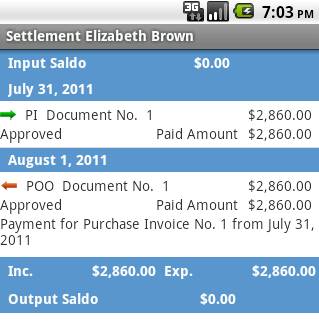 Balance is changing the client's invoice in the amount of settlements in the purchase price. On document prohibits editing and deleting. The operation of the posting of the document is reversible. In the case of input error, the document can "roll back". In this case, coming back will be made of. To "rollback" there are limitations. You can not roll back the incoming invoice, if the purchase invoice of the parties has already produced consumption goods. In this case, you first need to roll back spending bills with the goods of the purchasing party, then it will be available to "rollback" of a credit invoice. 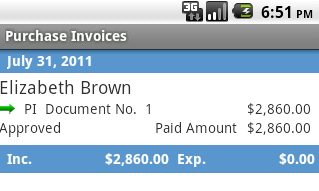 Pay for this Invoice by clicking on the "Pay" button. 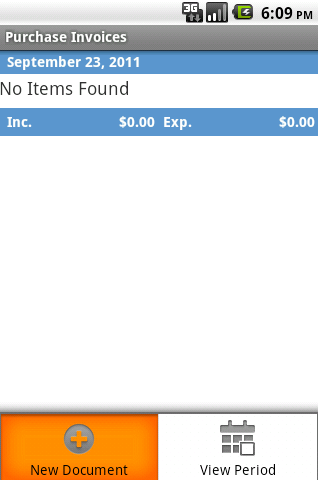 Will be automatically generated expendable cash order. These warrants were taken out of our program, a credit note. If necessary at this stage, any data can be changed. For example, if we pay a partial sum, we can change it. Invoice we can pay a few partial payments. The program will check that the sum of the partial payment does not exceed the amount of a credit invoice to the purchase prices. We carry out this cash receipt. In the Invoice document we appeared in a "place". 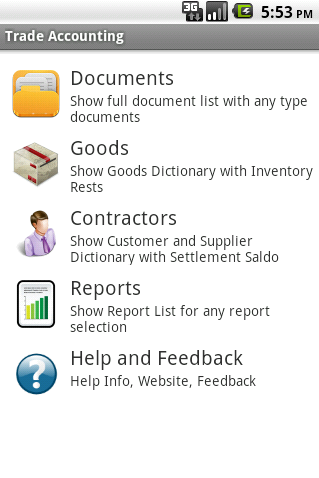 We now return to the main menu (on the phone button "Back") and open the directory products. The directory of long-term counterparty clicking on a line with a contracting state of emergency, "Elizabeth Brown" will open the context menu. Click on the item "Settlement Card" Open card contractor mutual settlements. 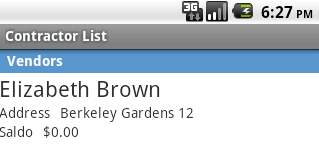 By and large, this is the same list of documents, only selected on the counterparty "Elizabeth Brown". At this stage of posting the goods will be implemented. What changes have occurred in our data, and where to look. 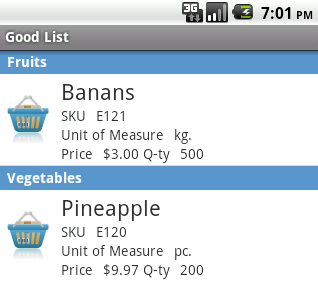 In goods remains unchanged (reference product). The survey items on a long press on the goods you can see a list of procurement card parties and movements of goods. 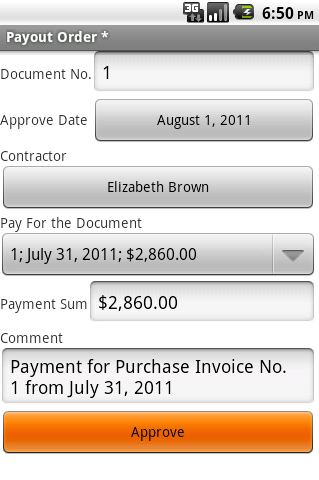 The handbook contractors can see the balance (remain unchanged if the incoming invoice is fully paid for). 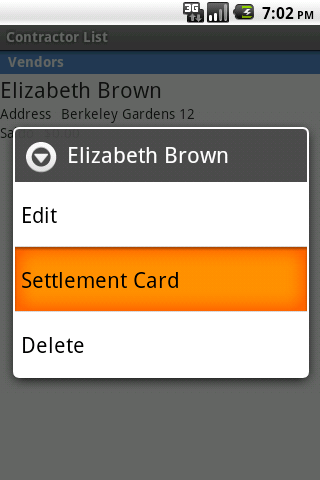 The handbook contractors can be seen on a customer card settlements, calling it from the context menu. The reports look cash turnover, which will see the movement of money. In our case, the impact fee bill with a credit withdrawal cash orders.